Remember Ocean’s 11, where Danny Ocean pulled off an elaborate, overly complicated heist on one of the most secure vaults in Vegas? Maybe we’ve seen too many action flicks, but a robotically controlled storage facility with biometric recognition and retinal scanning seems like the perfect opportunity to try this out in real life. 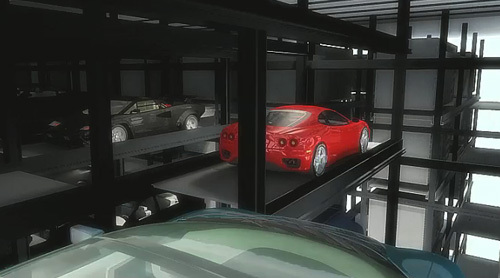 RoboVault, which claims to be “the first storage facility of its kind in the world,” is a fully automated robotic container retrieval system that stores valuables ranging in size from automobiles to artwork. The South Florida facility is currently under development by storage facility developer Marvin Chaney who has developed self-storage facilities for more than 25 years. The robotic retrieval system is being developed by Westfalia Systems. The exterior is designed to withstand Category 5 hurricanes with winds up to 200 mph. Provides a strict climate controlled environment meeting wine industry standards of temperature and humidity that allows the collector to incrementally expand their personal cellar capacity. Here is a video with animated renderings of what the facility will look like in action.